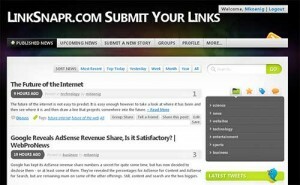 LinkSnapr is a new social bookmarking site like Digg, StubmleUpon, or Delicious . It has a nice new web 2.0 interface and sign-up seems to be a breeze. We’ve submitted several pages and can say we are pleased with the site as a whole. Much like digg you can vote up or down the submissions of others. Current categories are science, news, websites, technology, entertainment, sports, and business. So if you are looking to promote your website or article then post it over at linksnapr.com tell your friends and bump it up to the first page.